Closeup of Painted Ladies house painted blue with green trim. 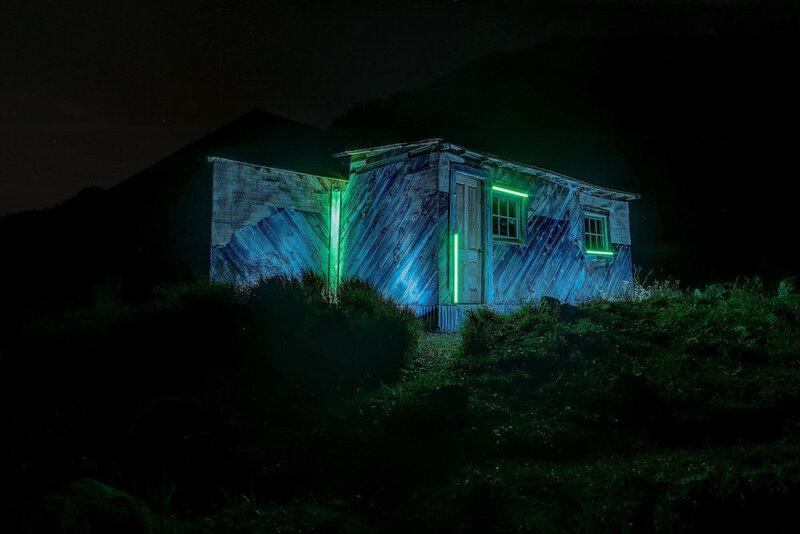 This house dubbed the Neon Outpost. Temporary art installation in Animas Forks ghost town - South-West Colorado. 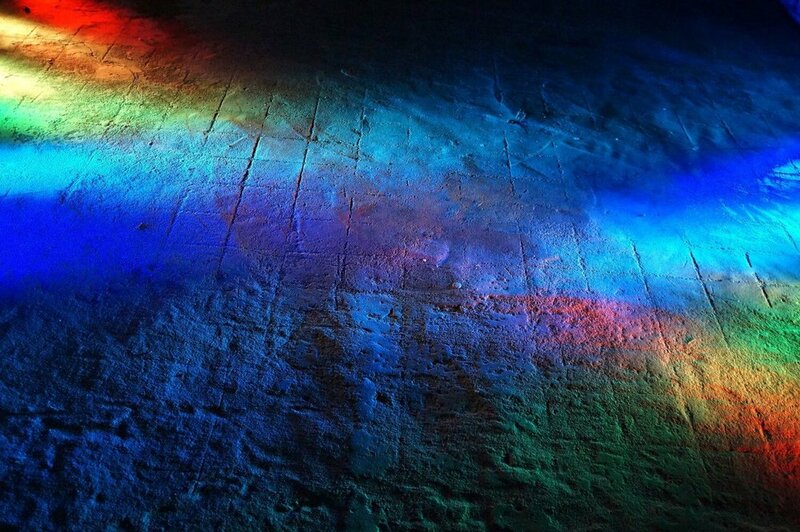 Knomad Colab creates site-specific, public art installations employing a unique combination of LED light, sound, and pre-existing infrastructure. 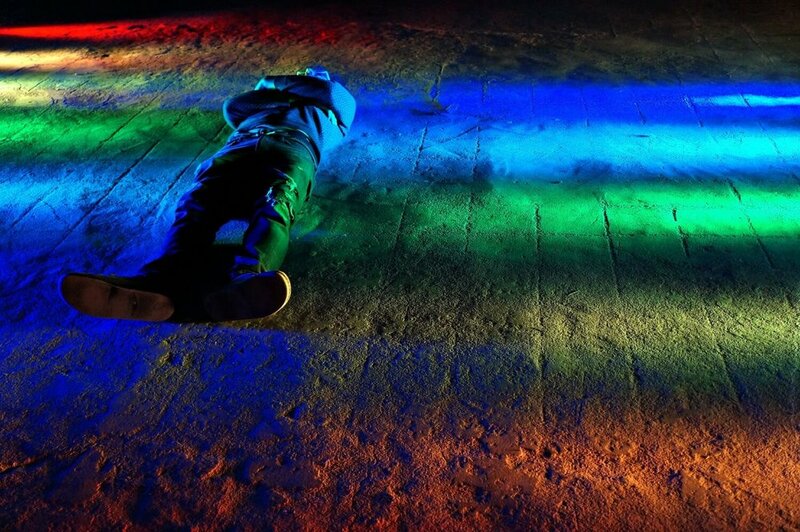 We paint with light and sound, activating and transforming abandoned and underused spaces, and industrial decay. Landed 1 conveys an otherworldliness- something unfamiliar and bizarre and too progressive to understand. 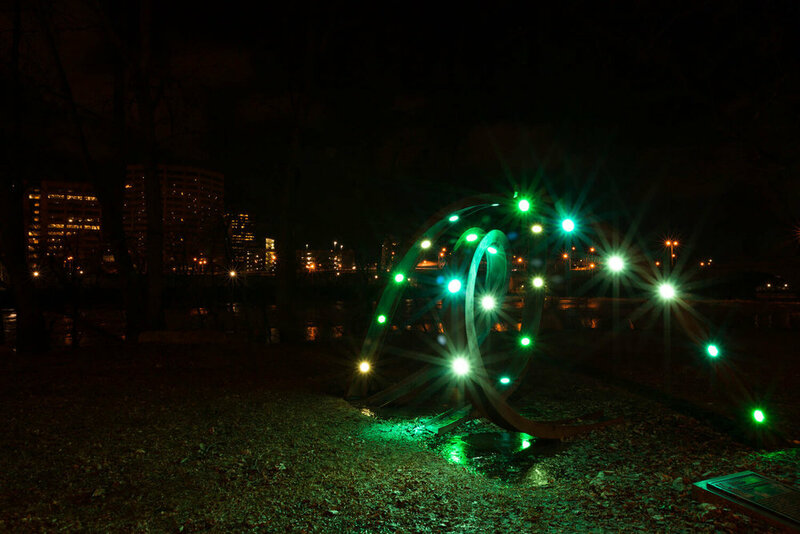 During this one-night installation, light transforms an obfuscated park sculpture titled Transcontinental into a temporary beacon along the river banks of Hartford Connecticut. This is the second image in a series of three from one of our freshman light installations. This took place in an old industrial building known as the Mockbee in Cincinnati Ohio. Once a bustling DIY space for art and music, the now vacant space is a canvas unlimited potential. The first image in a series of three from one of our freshman light installations. This took place in an old industrial building known as the Mockbee in Cincinnati Ohio. Once a bustling DIY space for art and music, the now vacant space is a canvas unlimited potential. This is the third image in a series of three from one of our freshman light installations. This took place in an old industrial building known as the Mockbee in Cincinnati Ohio. Once a bustling DIY space for art and music, the now vacant space is a canvas unlimited potential. 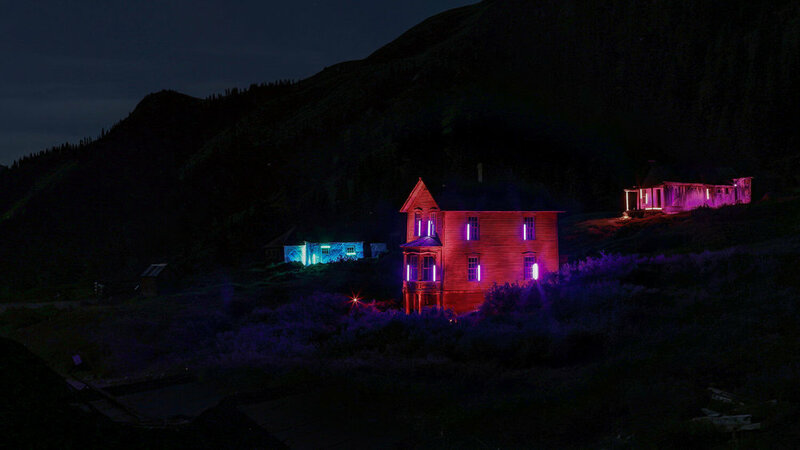 Across the road view from Embed - a light installation at the historic Coke Ovens in Redstone, CO. 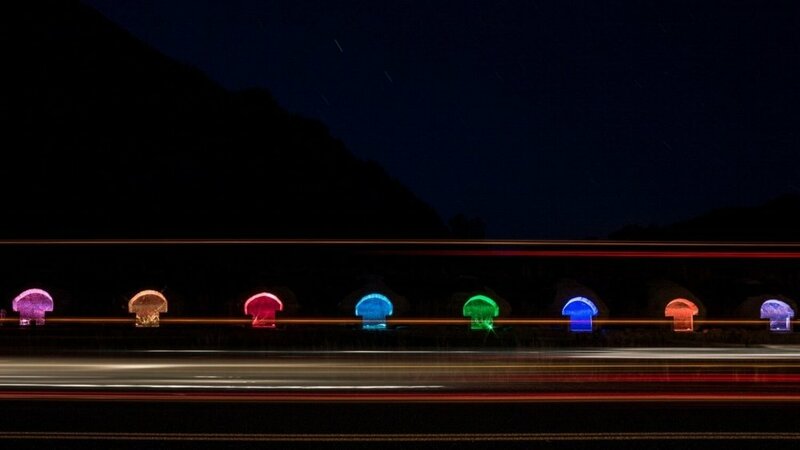 This is a long exposure photo from across the road, so we caught a bit of highway traffic. A symbol of unity and community, Gather II was created to honor the joining of two dear friends. This installation took place along the banks of the Colorado River in Rancho Del Rio, Colorado. Site-specific light and sound installation working with pre-existing park sculpture in Savannah Georgia. Sitting in the midst of all the hustle and bustle of the artsy town of Savannah, Georgia, this historical bell is largely overlooked. Once a crucial alarm for the start of the business day in old Savannah, it now stands silent as an artifact of the past. Painted Ladies is a temporary art installation in Animas Forks ghost town located in South-West Colorado. Closeup of Painted Ladies house painted fascia with orange trim. This house dubbed the Shack. Temporary art installation in Animas Forks ghost town - South-West Colorado. Closeup from Buried, temporary installation taking place in Virginia Beach, Virginia. Buried was a ceremonial shedding of the past. Wrapping our Astera led Light Drops in mylar and burying them into the sand gave the appearance of a large beach bon-fire. Wind whistling through the mylar created a harmonious hum. 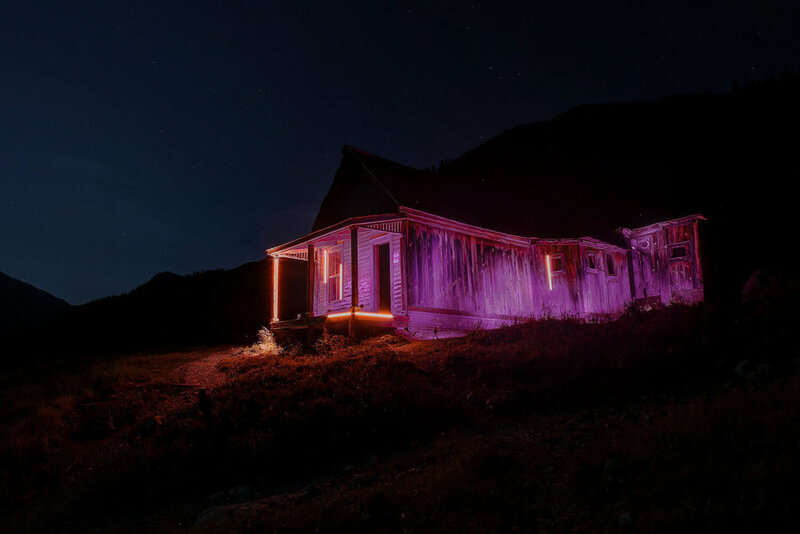 Located outside of Nederland, Colorado, our first ghost town installation, Silver is Dead, is a glimmer of what was, what is, and what will be. Closeup of Painted Ladies house painted red with purple trim. This house dubbed the Mansion. Temporary art installation in Animas Forks ghost town - South-West Colorado. A symbol of unity and community, Gather I was created to honor the joining of two dear friends along. This installation took place along the banks of the Colorado River in Rancho Del Rio, Colorado. 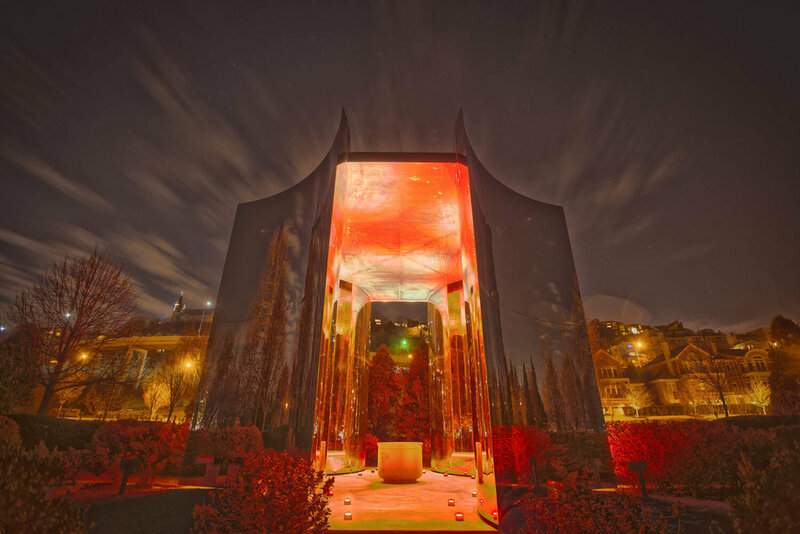 Taking place in a pre-existing sculptural structure in Cincinnati's Friendship Park, this installation, titled Kaleidoscope, invites passersby and onlookers to bathe in endless patterns of colorful light. Created with astera led light drops, Something Which Does Not Exist is the archetypal embodiment of what we do as artists. This temporary installation took place in Irving Texas outside of Dallas. This installation, titled Abandoned, invokes an erie, almost uncanny feeling about this nearly abandoned farmhouse outside of Kansas City, Missouri. 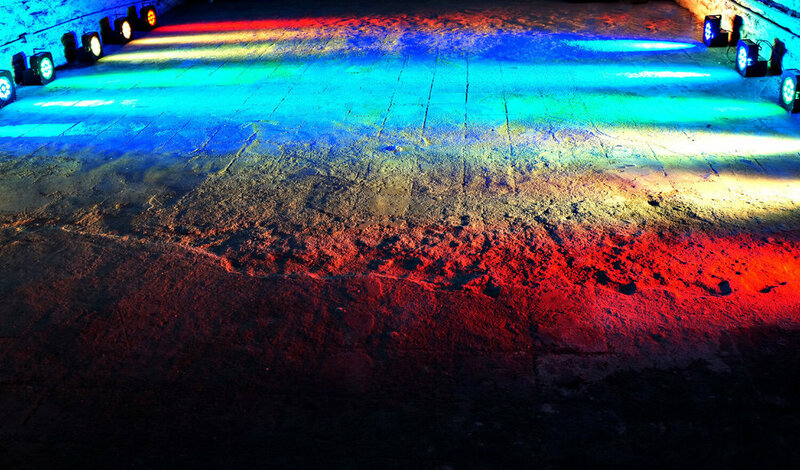 We used red led lights, which was placed within the house to make it appear from the outside as if it were oozing red. View of Embed as the sun rises. 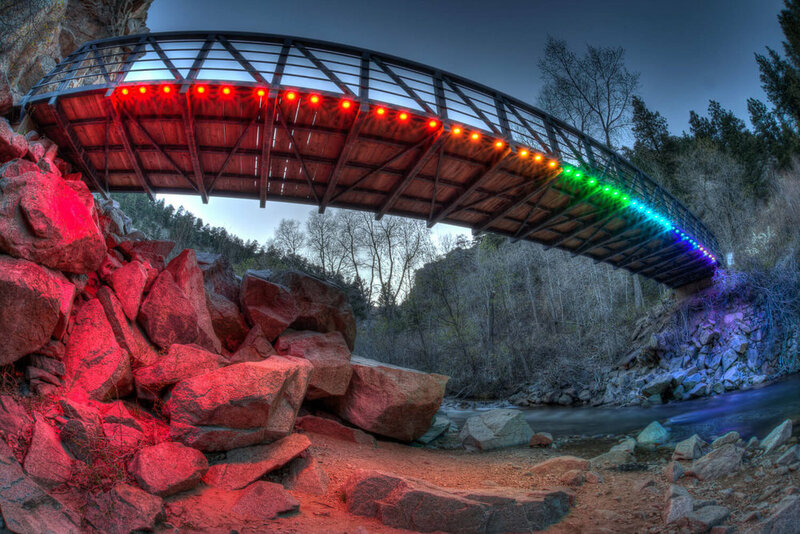 This was a temporary light installation at the historic Coke Ovens in Redstone, CO. This is a long exposure photo from across the road, so we caught a bit of highway traffic. Amid the Sandia Mountains outside of Albuquerque, New Mexico there sits a lonely firehouse.